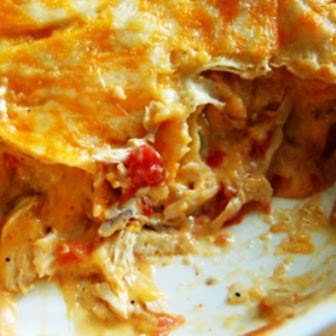 I woke up this morning craving King Ranch Chicken, by far my favorite hibernating, comfort food, rainy day, deep South Winter meal. KRC was clearly formulated for such a day as this. It's not a health conscious meal...by far. In fact, if you made a New Year's resolution to eat better, LOOK AWAY NOW....if not get ready to cook-up your very own KRC. TDC disclaimer: you are now on your own. Regardless, the bottom line is I wanted KRC this morning for breakfast. And let me just stop right here and state the obvious, when I am craving one thing and I end up settling and eat something totally different ....that craving is still sittin' there calling my name. In which case, I subconsciously try to fill that craving by doing what my mother calls 'heavy snacking'. For me it's better to make it, eat it and put it away. In doing so, I save myself unnecessary calories. Me and my mother, isn't she cute? Jumping out of bed, I began digging through the pantry hoping I could throw together an impromptu King Ranch Chicken casserole. Low and behold...I had every single stinking ingredient minus the green bell pepper! Yeah me! I hope you enjoy my second favorite hibernating meal. As Martha would say.... it's a good thing. Excuse my pictures....I didn't even think to snap a photo before I ate! If you're interested in reading about the King Ranch here's a good link. 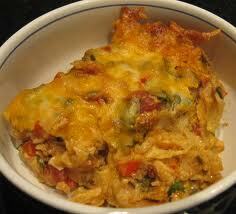 In Texas, we have a Tall Tale about how King Ranch Chicken was concocted. Not sure if it's true or not but it makes a grand story. I do know this, if you are heading to the Texas/Mexico border you better make a pit stop before driving through the King Ranch. You can drive down highway 77 for an hour and not pass a thing....it's a little eery. Kingsville is your last chance for some time. Pour oil in large skillet. Add onion and green bell pepper; saute over medium heat until tender. Add chicken, cream soups, Rotel, and all seasonings. Stir and cook over medium heat until bubbly. Tear tortillas into small pieces. Place half of the pieces in a 9x13 inch dish. Top with 1/2 of chicken mixture and 1/2 of cheese. 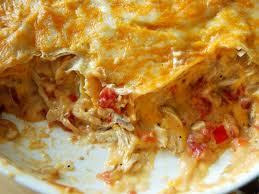 Top with remaining tortilla pieces, remaining chicken mixture, and remaining cheese. Bake at 350 for thirty minutes, or until bubbly and lightly browned around the edges. Pour oil in a large saucepan. Add onion and green bell pepper; saute over medium heat until tender. Add chicken, cream of chicken soups, Rotel, salsa, chicken broth, Velvetta and all seasonings. Stir and cook over medium heat until the Velveeta melts and the pot is bubbly. It will be a bit soupy but the chips will absorb the liquid and your KRC casserole with NOT be slimy. Place a layer of Tostito chips in a 9x13 inch casserole dish. Top with 1/2 of the chicken mixture and 1/2 of the cheese. Top with another layer of chips; pour over the remaining chicken mixture, and remaining cheese. 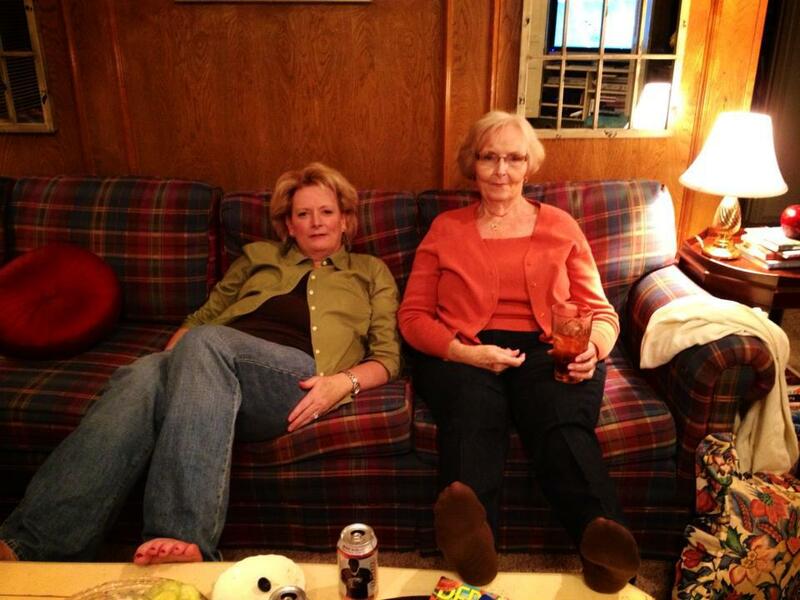 Ronda, loved seeing the pic of you and your mom. Yes, she is so cute....and you too. As for that Chicken dish, it sounds absolutely scrumptious. I just bought chicken today for the crock pot. Unfortunately many of the "American" ingredients in KRC are not available here, but sometimes I take general ingredients and make my own version of things.